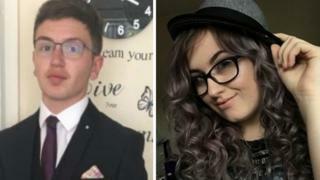 Monday's newspapers highlight the scale of knife crime following the fatal stabbings of two promising 17-year-old students over the weekend - Jodie Chesney in east London and Yousef Makki in Greater Manchester. The Mirror says Britain is in the grip of a horrific knife epidemic, and has the headline: "Anyone's street, anyone's child". For the Daily Mail, the latest murders are a "Knife to the heart of Britain". It says doctors are battling to save three children a day on average, as knife crime rates soar to the highest level since WWII. The Express leads on a call by the former Metropolitan Police Commissioner, Lord Hogan-Howe, for the government to deploy 20,000 more police on the streets as quickly as possible and recruit a knife crime tsar to tackle the violence. For its main story, the Daily Telegraph says it has been told that the Attorney General has abandoned attempts to secure a time limit or unilateral exit mechanism from the Irish backstop in his negotiations with the EU. According to the paper, ministers briefed on Geoffrey Cox's approach say the central demands of Eurosceptic MPs are considered too "blunt" and have been rejected by the EU. The Telegraph says some cabinet ministers are already resigned to Theresa May losing a second meaningful vote on her deal, amid concerns that changes to the backstop secured by Mr Cox in the continuing talks won't be enough to win over Brexiteers. The Financial Times reports that the chancellor, Philip Hammond, is set to receive a multi-billion-pound windfall for the public finances when he presents his spring statement next week - increasing the size of his promised Brexit "deal dividend" if MPs finally back the EU withdrawal agreement. The paper says Mr Hammond will have more headroom, thanks to buoyant income tax receipts, with self-assessment returns paid in January especially strong. However, the Financial Times adds, Mr Hammond will warn MPs that if they throw out the prime minister's deal again and allow a no-deal exit, they would be putting at risk billions of pounds of extra spending on schools, police and other public services. The Guardian says a surge in UKIP membership is shifting the party decisively towards the far right, as long-standing moderates are replaced by entrants attracted by an anti-Islam agenda based on street protest. An investigation by the paper has found that membership has risen by about 50% over the 12 months from a low point a year ago, rapidly reshaping the party in the image of its leader, Gerard Batten, who has appointed the anti-Muslim activist, Tommy Robinson, as an adviser. Finally, the number of pubs, bars and clubs with a 24-hour alcohol licence has fallen significantly in the last five years - because young people are looking for other ways to have fun, says the Daily Telegraph. The paper says research suggests the increasing popularity of Netflix and dating apps have contributed to a cultural shift in how people socialise, affecting demand for drinking in late-night venues. According to the Daily Mail, separate research shows that young adults are also turning away from drink - with 29% of 16 to 24-years-olds describing themselves as non-drinkers in 2015, up from 18% in 2005.